Hahaha...congrats, deadlines are the work of satan anyways. Oh, and I forgot to ask, dark (or Alex...hehe, I now know that is your name) ... are you able to rip videos from the cell phone games? Nick P. and I (I think you know who that is...Ratchet) are making a video to celebrate Spyro's tenth birthday (Sept. 9, 2008) and need videos from all the games we got 12 out of 14 games worth of videos, we need vids for the Fairy Ball game on mobile phone (Spyro), and the Shadow Legacy Sequel on Mobile (Spyro the Dragon) ... and Nick suggested I ask if you are able to rip videos from these cell phone games or happen to have a place where we could get these vids? I'm afraid not, no, sorry. Did you forgot about the maps half way through or just not work on them much? Wonder how hard it would be to create maps for the three playstation Spyro's. Not so much forget as put-off, I originally meant to make the maps and write the guide at the same time but then decided partway through to concentrate on the guide and stopped with the maps. And as for maps for the PlayStation games, the only possible one would be Spyro 2 seeing as it has an ingame map and I'm useless at drawing maps by myself. It'll be a while before I even look into making them though. EDIT: Ah hah! Scratch that Neal, I can indeed record Spyro the Dragon after all as well as Ripto Quest if you need that. Though still not the fairy one as I don't have that 'game' at all. Hey, the red fox ... I've posted that before, that was right after Insomniac left, there was supposed to be a new Spyro going to X-Box, GameCube, PC and PS2...it never happened and it just sort of fleshed out into Enter the Dragonfly, which was supposed to have been stored on a DVD disc to have things like developer interviews and other game previews, but wasn't, and it was supposed to have a new playable character and Spyro ride a surfboard...but it didn't........my point is, that's old news, but even when it was new news no one paid much attention to it, and it never came to be, may ideas don't work out, like the article you posted. Whatever the game mentioned there was supposed to be never came to be...and who knows how much of that got worked on, or if it simply was Enter the Dragonfly and got downgraded to just two consoles...either way look at IGN's search results...that game mentioned in your article got cancelled, and ETD came out instead, so it is simply a cancelled game, so not too much to be confused about. Okay, dark, all we have for Ripto's Quest is a clip from the only site that still seems to sell the game...iPlay...on the Ripto's Quest page they have a three second video that loops endlessly, and that is all we have. So if you could rip videos of some cool scenes from both Ripto's Quest and Spyro the Dragon, that'd be great! I thought you did have the fiary game, being as you have more screenshots than anybody else...I only have four shots...but you have more, so I thought you owned that "game". Nah, I got them from other places, such as SPOnG. But I never am able to view a page on SPOnG, I get a search result, but then click to go to the page and it takes me back to the homepage, why is this, do I have to join their site or something? Dunno, maybe they just don't like you. Thanks Neal. I never really have the time to look at these sort of things anyway. The date was confusing and I wasn't there when you posted that but thanks. Try deleting your temp internet files via the Internet Options menu (from Tools). Ususally whenever I can't browse a site I delete them and it works. 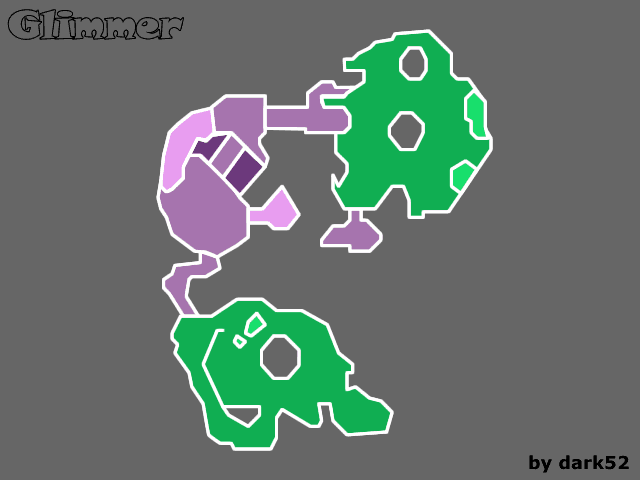 In a matter not too far flung from the news post's original intent, here is an early barebones map of Glimmer from Spyro 2: Gateway to Glimmer which is probably what any futher maps will look like, ie close to identical to those in the game itself. Of course it's currently completely useless to all but those who don't know how to turn on the map feature in the game itself, but there it is for now. UPDATE: I will indeed be pursuing the creation of maps for Spyro 2 in the future but it'll probably have to wait until October at the earliest, Christmas more likely.